False claims: Media outlets attempt to link Ambassador David Friedman to movement declared 'Jewish terror group' by State Dept. Last Friday, the Jewish Telegraphic Agency (JTA), a New York-based wire service with a focus on Jewish and Israel-related news stories, dropped a bombshell, claiming that prior to his appointment, US Ambassador to Israel David Friedman had overseen the donation of thousands of dollars by a charitable organization he headed to a terrorist organization. 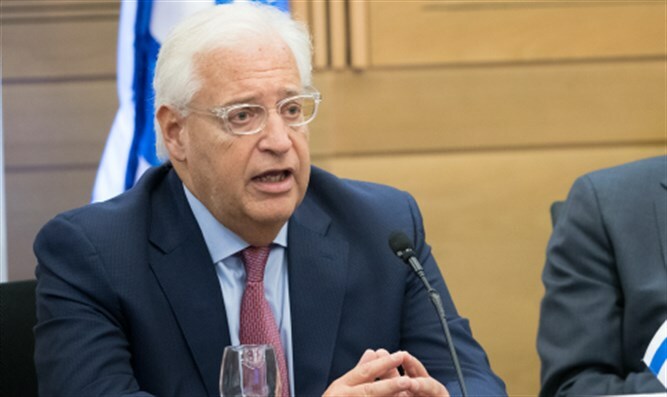 Under the headline “Charity headed by David Friedman, US envoy to Israel, gave money to terrorist group”, JTA claimed that before being tapped to serve as ambassador, Friedman had presided over a charity which in 2013 gave more than $12,000 to a group recognized by the US State Department as a terrorist organization. Friedman had served as president of the charity, which he later left prior to his appointment as US Ambassador to Israel. The charity reportedly donated $12,000 to the NGO Komemiyut, the left-wing group “Democratic Bloc” claimed. The JTA report then proceeded to link Komemiyut to a second group with a strikingly similar name – Qomemiut. Both organizations, it should be noted, are spelled the same way in Hebrew. Qomemiut, JTA noted, was declared a terrorist organization by the US State Department in 1997, and was later added to Canada’s own terror watch-list, prompting JTA to accuse Friedman of donating to a recognized terror group via the charity he presided over at the time. Multiple media outlets carried the JTA report accusing Friedman of funding a terror group, while the left-leaning daily Haaretz carried a separate piece entitled “Did Trump’s Israel Envoy Support a Radical-right Kahanist Group?”. In reality, however, there is no evidence that Komemiyut and Qomemiut shared anything except their name, which means “upright” or “sovereign independence”. According to Qomemiut cofounder Baruch Marzel, the group was founded in 1994, after the Israeli government banned the Kach and Kahane Chai movements. Founded by the American-born Rabbi Meir Kahane after he immigrated to Israel in 1971, the Kach party advocated the annexation of Judea, Samaria, and Gaza to Israel, and the transfer of the local Arab population out of the country. After the party won a seat in the Knesset in 1984, the controversial party was barred from participating in the 1988 elections on the grounds that it negated Israel’s democratic character. Following Rabbi Kahane’s assassination at the hands of an Arab terrorist with ties to Al Qaeda in 1990, the movement split in two, with Kahane’s son, Rabbi Binyamin Zeev Kahane founding the “Kahane Chai” [Kahane Lives] faction. Both Kach and Kahane Chai were barred from the 1992 elections, and were outlawed in 1994. In an interview with Arutz Sheva, Marzel said that Qomemiut was established by Kach activists as a means of skirting the 1994 ban. Three years later, the US State Department banned Qomemiut, listing it as one of the aliases of the Kach movement. The short-lived Qomemiut drew little attention inside of Israel, and the name was not widely recognized. When a group of leading Religious Zionist rabbis joined together to form a new movement to promote Jewish identity in Israel and oppose future evacuations of Jews from Judea and Samaria, few realized the name had been previously used. Founded during a convention in Jerusalem’s Bayit Vegan neighborhood in 2006, Komemiyut was formed largely in response to the 2005 Gaza Disengagement plan. In an interview with Arutz Sheva on Sunday, Komemiyut chairman Moshe “Mussa” Cohen denied the JTA report which claimed he had confirmed his group’s ties with Qomemiut. "It's just horrible. It doesn't make any sense,” said Cohen. “How could it be that a group that was founded after the [2005 Gaza] expulsion, in response to the expulsion, in 2005-2006, could be linked with something else that existed so long before it?" The two movements, Cohen emphasized, had absolutely nothing in common, and blasted media outlets for claiming his group had been declared a terror organization by the US State Department, stating that the JTA article which cited him had misrepresented his statement. "Somebody called me, speaking in Hebrew that was difficult to make out, and asked me 'is the Komemiyut of today the same as the Komemiyut that used to be’," Cohen told Arutz Sheva. Believing the question was whether his organization had remained the same since its founding 12 years ago, Cohen replied in the affirmative. Little did he know that he would later be accused of running a group designated as a terrorist organization. "There's nothing to connect [with Qomemiut] - we have absolutely no connection whatsoever. How could there be any connection between a group that was founded in 2005 because of the [Gaza] expulsion and a group tied to Rabbi Kahane from decades ago?" Komemiyut, Cohen continued, has no partisan ties to any party, though it does share ‘ideological ties’ with the Tekuma faction of the Jewish Home party, a member of Prime Minister Netanyahu’s coalition government. "We're not a political group. Komemiyut was founded by Rabbi [Zalman Baruch] Melamed, Rabbi Elyakim Levanon, Rabbi David Hai HaCohen. It's true that ideologically we tend to identify with Tekuma, so for years we were in contact with them. But we're not a part of Tekuma, and Tekuma has no ties with us." "The group isn't very active now, but when it was, Komemiyut worked to help strengthen Jewish, Torah values and identity in Israel, and to promote the idea of the Land of Israel. We wanted to stop any future evacuation [of Jews from Judea and Samaria]." Cohen accused media outlets which linked his group to Qomemiut and claimed his organization had been labelled a terror group of “defamation”. "As far as I'm concerned, anyone who keeps drawing this connection between my organization Komemiyut and the other group is leaving themselves open for a defamation lawsuit.